Casting Bill Murray as beloved American president Franklin D. Roosevelt certainly caused a stir in the press. And the fact that Hyde Park on Hudson was based on diaries by FDR’s distant cousin Daisy Suckley, which revealed her affair with the president, added more mystique to the project. Still, the critical and audience response to the film’s US and Canadian festival debuts at, respectively, Telluride and TIFF was lukewarm. Narrated by Daisy Suckley (Laura Linney), Hyde Park on Hudson initially depicts the gradually developing romantic relationship between President Roosevelt and his quiet, well mannered but lovely sixth cousin. The viewer is brought into the special world of Hyde Park, a mansion in upstate New York that was FDR’s second home for most of the years that he was in the White House. Surrounded by women—his mother, secretary Missy LeHand, Daisy, with occasional visits from his wife, Eleanor—President Roosevelt flourishes, broadcasting his famous radio chats, granting interviews and meeting foreign dignitaries. In 1939, the young King George VI and Queen Elizabeth (the same real life figures from The King’s Speech) arrive to persuade Roosevelt to support them—and the British Empire–in the upcoming War. Both are shocked by antique anti-British caricatures hung on their walls—but they’re even more amazed as they gradually realise Daisy’s role in the household. Before the weekend is over, the Royals will have learnt even more about FDR as will Daisy. What also becomes apparent is that FDR’s charm can conquer most hearts—British royalty, his cousin and the American public. It may have seemed like stunt casting but Bill Murray is fine as President Roosevelt. Dialing down his comedic excesses, Murray offers a very credible interpretation of a complex individual: a polio victim, a lover and an American aristocrat who managed to fulfill the dreams of millions for over a decade. Laura Linney is excellent as Daisy Suckley. When isn’t she excellent? Linney may be the best screen actress in America. She’s certainly can match the thespian prowess of Meryl Streep–although Linney is unlikely to ever be a huge star. Perhaps she’s too subtle a performer. In any case, you completely “get” Daisy: a proud, bookish woman who has her own standards and values—and does know how to love someone, even in unusual circumstances. Olivia Williams is great as Eleanor Roosevelt—though perhaps she’s too lovely for the role. (She’s definitely a Hollywood version of Eleanor). As the royal couple, Samuel West and Olivia Colman are good but they will never challenge Colin Firth and Helena Bonham-Carter. Roger Michell is a very good director of actors. Think of Peter O’Toole in Venus and Julia Roberts and Hugh Grant in Notting Hill—their performances are note perfect, surely a tribute in part to Michell. But Michell is best when he’s working with great scripts by writers like Hanif Kureshi (Venus, Buddha of Suburbia) and Richard Curtis (Notting Hill). If the film is too slow or shifts gears too frequently, Michell isn’t the director to sort it out. Hyde Park on Hudson has too much going on to satisfy anyone. Is the film meant to be Daisy’s tale of her romance with FDR? Or a comedy about a visit of the Royals to America culminating in the King actually eating a hot dog? Or a character study of President Roosevelt? The moviemakers couldn’t find a through line in the film—and neither will the audience. Still, it’s nice to see Murray and Linney working well together. Hyde Park on Hudson is hardly a roaring success but this charming misfire will certainly have its admirers. PHOTO credit: Nicola Dove. 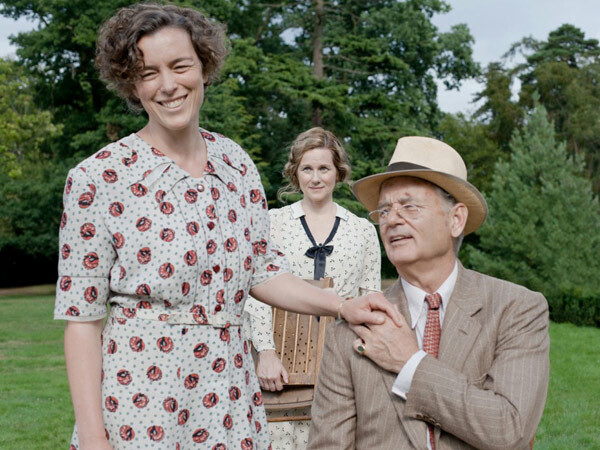 (L to R) Olivia Williams as Eleanor Roosevelt, Laura Linney as Daisy and Bill Murray as Franklin D. Roosevelt in Focus Features release, HYDE PARK ON HUDSON.